here i am in stripes again! don't know why but, i've been a bit on a stripe streak lately. different from my parisian stripe look i wanted something with a bit more of a summer look. so i paired it with 2 different tones of blush. what i love about this cardigan is the sheer "surprise" in the back. i love outfits that give a total different vibe from front and back. and the jeans...it was a total hit on the streets! i got compliments on the color. it's the perfect blush! i didn't realize it when i was out and about, but when i was looking at the pictures my outfit reminded me of a creamsicle! that actually sounds really good right about now...doesn't it? the stripes are pretty classic! awh, you look beautiful as well! 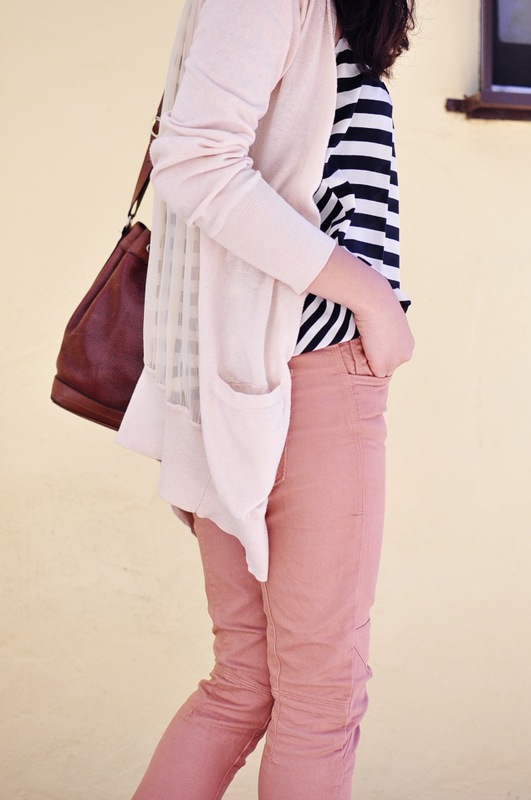 I'm addicted to stripes :) You can't have too many of striped tops. I love your jeans! I haven't found the right fit or color yet.